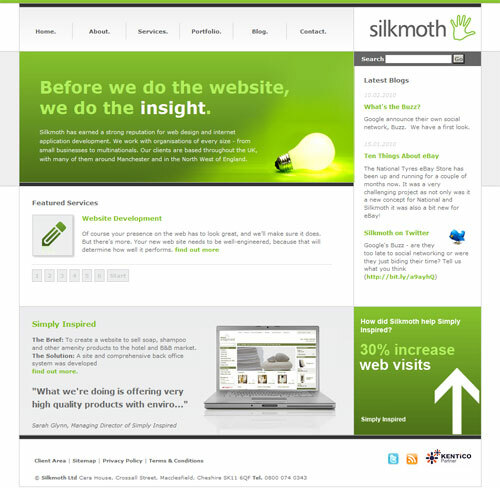 The Silkmoth Website, powered by Kentico CMS. You may have noticed that I have not updated my blog since last year. Well, the main reason for that is that I have been very busy with projects at Silkmoth. Moving from our in-house "Wirenet CMS" system to Kentico has presented challenges, but has enabled us to create some great websites, such as a new website for IT Recruitment Company Adria Solutions, built in Kentico and designed by myself. Indeed, the new website for Silkmoth, Web Design Macclesfield is itself written in Kentico. We have also been working extensively for our automotive customers. We have carried out continued work on the market leading Tyres website Tyre Shopper, and on a complex project to launch National Tyres on eBay. Indeed, the eBay project has been one that I have spent some time on, utilising the eBay API to offer a professional presence on the site. At Silkmoth, we are now using Visual Studio 2008, and we are continuing to develop sites using the latest technologies and techniques, including LINQ and AJAX. In addition to web development, I have been continuing to research and apply the latest techniques in Search Engine Optimisation to gain advantage in the search engines for the sites that we look after.